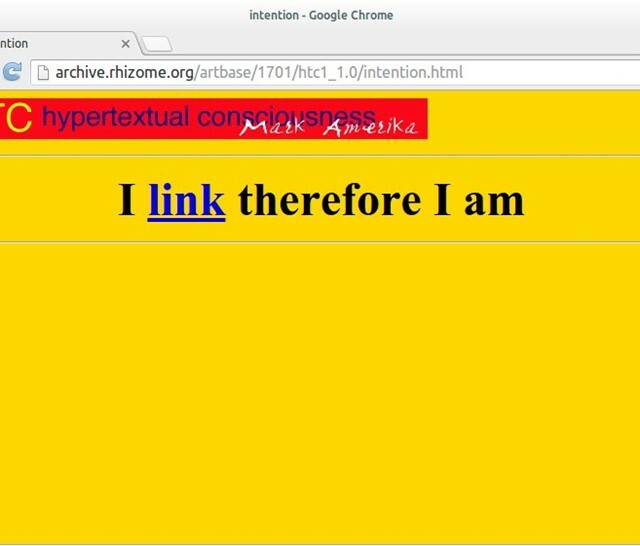 Rhizome was one of the first platforms to take net art seriously. Starting as an email newsletter in 1996 by artist Mark Tribe, the non-profit organisation’s mission statement is to support “contemporary art that creates richer and more critical digital cultures”. For 20 years now, the online art platform has established itself as a leading space for content merging art and technology, while also providing critical engagement with the online infrastructures that allow it to exist. It has also initiated a number of groundbreaking projects, including Seven on Seven, where artists are paired with technologists to create a brand-new project of their own, and ArtBase, a rolling public archive preserving more than 2,000 digital artworks, one of the biggest databases of its kind on the net. At the moment, Rhizome has nine major artworks from its archives on show at the Whitechapel Gallery’s Electronic Superhighway, “a major exhibition bringing together more than 100 works to show the impact of computer and internet technologies on artists from the mid-1960s to the present day”. Catch them before the exhibition ends on May 15th. Below, Rhizome’s executive director Zachary Kaplan picks out ten net artists that we should look out for this year.